In 2003 I had a strange little weight-driven wall clock with a diamond-shaped dial, sometimes called a lozenge shape, rather like a square dial standing on one corner. The clock was made in the 1690s by Thomas Banister of Norton. I had seen such a clock once or twice before, though very rarely and I could not remember where. I seemed to recall they were called 'picture frame clocks', in that they normally were enclosed by a wooden surround, rather like a picture hanging from one corner, though Thomas Banister had lost his frame. Bill Linnard later took an interest in this clock and established that the maker was Thomas Banister, who was born about 1670, worked at Norton Canon, Herefordshire, and later at Weobley, and died in 1751. In fact Bill researched further and came across four other examples, including one by Joseph Knibb with its original wooden 'picture frame' case, which had been featured by Dawson, Drover and Parkes in their book 'Early English Clocks' in 1982. He wrote about them in the Horological Journal in May 2005. These clocks are very unusual, so unusual that when Dawson, Drover and Parkes, three massively experienced horologists, illustrated the example by Joseph Knibb in 1982, they believed it might be unique, not just unique to Knibb but unique to clockmaking - that's how unusual they are. And so when Bill Linnard came across yet another example, he wrote another article in Horological Journal for April 2006. Then in April 2007 he summarised the position in a third article listing those he had found by scouring all available literature and by appealing for information, which by then numbered thirteen examples. 1. An anonymous diamond dial clock of the 1690s is pictured here alongside a standard-sized lantern clock of roughly the same age. Click for closer view. So what are these strange clocks and how do they fit into the overall scheme of things? We know the first domestic clocks in Britain were lantern clocks and were made from about the year 1600, gradually increasing in production. When the pendulum arrived in 1658 many lantern clocks continued to be made with the same type of balance wheel escapement they had always had, but slowly the verge pendulum came into use in these clocks. By the 1670s and 1680s the verge pendulum form of lantern clock was becoming the norm. Even with a verge pendulum the lantern clock was still a costly item, mostly having a striking train and very often having an alarm feature too. They were tallish, averaging about 15 1/2 inches in height, the dial section standing about 6 inches high by about 6 inches wide. It must have been felt that there was a place for a smaller clock, a non-striker (which today we usually call a timepiece), without alarmwork, in fact just a simple tiny timekeeper to hang on the wall, which hopefully would also be much less costly. Judging by Bill Linnard's summary that is just what these clocks were, tiny little things, the dials usually only five inches square, without strikework and without alarmwork - though one of his thirteen, the Joseph Knibb one, does have an alarm. Most have these tiny dials, but one or two were made larger at 9 inches and one even at 12 inches. Most were weight-driven, just like a verge pendulum timepiece lantern clock mechanically. 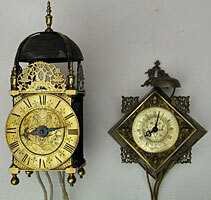 It becomes more apparent how tiny these clocks were when we see one illustrated alongside a normal lantern clock. The earliest three that he documents, which we might date between the later 1670s and 1690, have wooden picture frame cases. But there follows a group of four others, dating from a slightly later period between about 1690 and 1710 or 1720, which have brass frames, as does the anonymous one illustrated here. Two have their brass cases totally plain but two others, including the one pictured here, have their brass 'picture frames' ornamented by means of a spandrel-like attachment on each of the four sides and a double-form spandrel (the twin cherub type) at the top. When I first saw one with these attachments I had the impression at first sight that they looked like later additions. But the documenting of another example with these same decorative spandrel-like additions, confirms that is the way they were meant to look. If you had the brass-framed model, you could have it plain or fancy. 2. 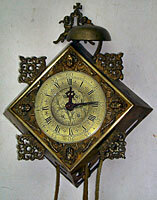 The same diamond dial clock seen in its brass frame with spandrel-like appendages. Original hands. Date about 1690-1700. Click for closer view. Some were single-handers but most had two hands. None of them had strikework, yet the one pictured here does. This is because it was modified to accept a bolted-on striking train. The construction is so similar it might even have been modified that way by its original maker. However the construction is so simple that it is difficult to draw any firm conclusion about that. Bill Linnard's survey found that, rare though they were, such clocks were known by the most famous in the land. One is known by Joseph Knibb of London, one by John Wise of London, and even Thomas Tompion made an eccentric spring-driven table-top version. For some reason this type of clock did not catch on. The lantern clock remained the only clock in widespread circulation until the 1670s and 1680s. Of course there were bracket clocks from the time of the pendulum's arrival (1658), but spring-clocks such as these were always costly as well as being less than accurate timekeepers and more temperamental than weight-driven clocks. The longcase clock was known from 1658 but it was not in widespread production until the later 1680s or 1690 onwards. Perhaps the greater efficiency, convenience and popularity of the longcase clock caused it to blossom at just the wrong time for the picture frame clock. For as the picture frame clock made a hesitant entry into the market, the longcase swept into the popular imagination, brushing aside these tiny picture frame clocks. The picture frame clock first appeared about 1680 and had pretty well faded away by 1710, maybe 1720 at the latest. Their period of manufacture lasted barely a generation of thirty years. This means that today they are very scarce items indeed - providing the greater pleasure for any collector who owns one. This article was first published in Clocks Magazine.